For travellers looking for urban elegance paired with mountain luxury, this Lofts townhome delivers. Sprawl out in 3300 square feet of living space designed with both privacy and functionality in mind. Each floor boasts its own master suite with en suite bathroom and the kitchen and living spaces are also location their very own floors. A Chef’s dream, the kitchen is outfitted with Viking appliances, a one-of-a-kind stone stove enclosure, large dining bar and room to entertain. Head up to the rooftop and host an après mountain adventure soiree while grilling on your BBQ or enjoying a dip in the hot tub – an entertainers dream. 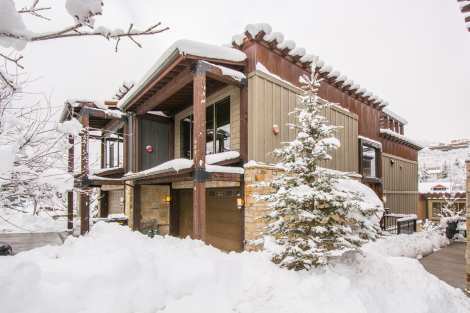 Mountain contemporary architecture brings together rich wood accents with metal and modern finishes. The Lofts are truly a unique architectural feature in Park City, and an in-demand lodging location for those in the know. Walk to Main Street or hit the free city shuttle, just steps away, and take your adventure to anywhere you like in the Park City area. The location is one of the best in Park City with both Deer Valley and Park City Mountain resort only moments away.